Here's a list of BPO companies that we know of that enables Business Continuity Plan (BCP) or providing hotel accommodations during emergency situation or extreme weather conditions. 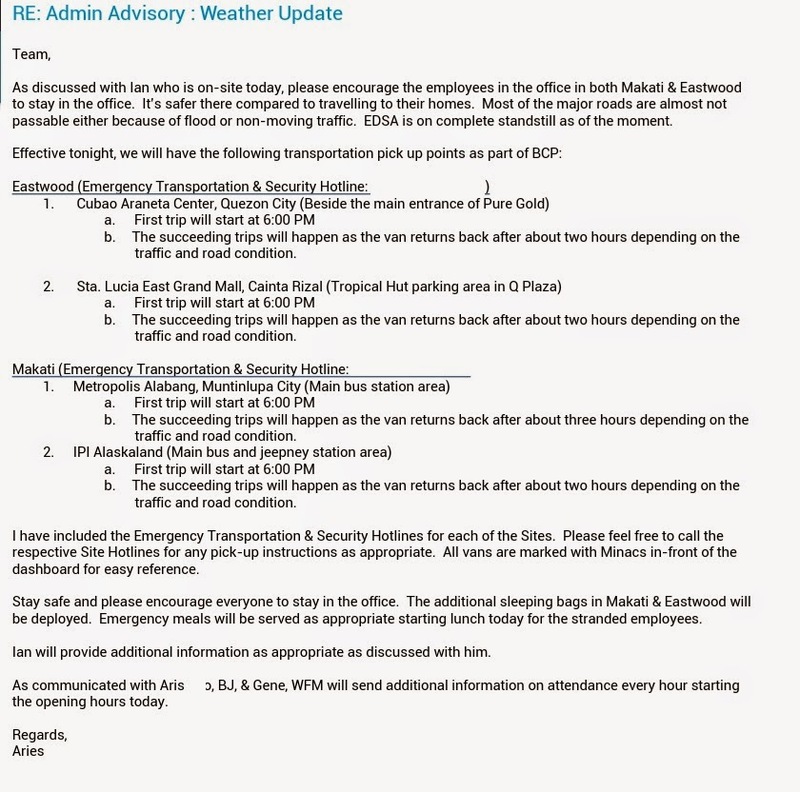 DELL Philippines Inc - Proactively sends a communication to employees asking of their status and advising to contact their respective manager for update. ADP - BCP is done by asking the employees if they would like to stay in return a hotel accommodation is prepared and a whole day free meal. Thomson Reuters - Also sends a proactive communication to employees, BCP is enabled by routing calls to other centers located in different parts of the world. The company also provides hotel accommodation. ACS Xerox - Provides hotel accommodation in MIDAS, Heritage and Tunes Hotel for stranded employees with meals. 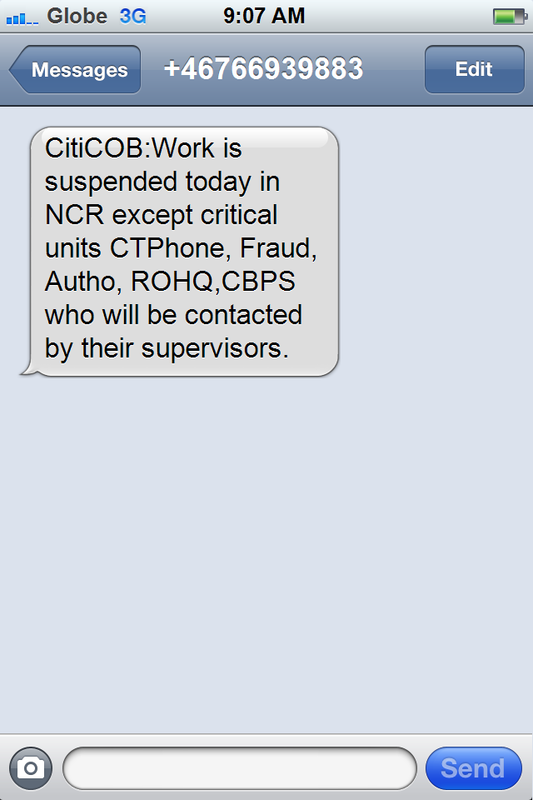 Citibank ROHQ - Sends SMS informing employees about work suspension. C3 - also implements the same process see the email that we have received below from Alvin Delos Santos Laggui. Acquire BPO - implements Business Continuity Plan as well. One of which is for Weather Disturbance. Info is posted on Facebook and they also have communications released to all employees via SMS and other social media. WNS - provides free shuttle service..free meals at work, sleeping quarters or the guest house where the agents can stay for the night, comfort room converted so agents can freshen up during storms. 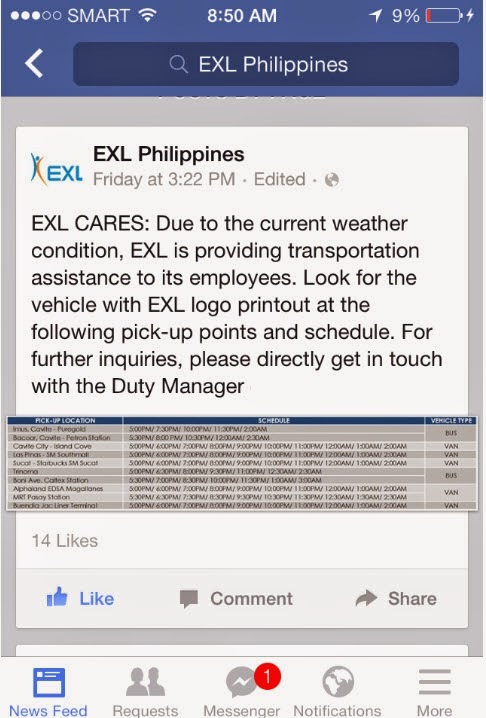 E-Trade - Shuttle, unli food & starbucks are provided whenever there is a typhoon. Stranded employees are billeted in hotels like Somerset, New World and Citadine. Sent by Dale. ANZ GSO - also provides hotel accommodation to employees. Sent trough email, we are following up for photos as additional info. HINDUJA GLOBAL SOLUTIONS (HGS) - Received trough email. Shore Solutions. FB and text updates, shuttle services, food provided free and premium paid. Sitel Philippines - Provides shuttle services for stranded employees and food to those who are in our offices. They also have a partnership with metro dorm in home depot should employees would like to stay. During last years habagat, they also have provided toiletries to stranded employees and company shirts also. 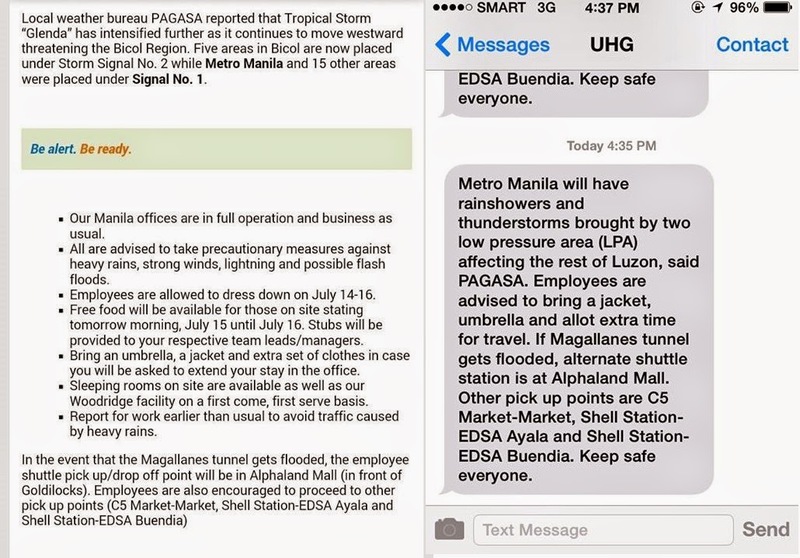 Email / text advisory to prioritize safety. Startek - already sent an email that they have the same process in place. We are awaiting confirmation on how they implement the company BCP. Chevron Holding - work is suspened early and employees who were stranded get free meals and booked to hotel. Employees were booked in Raffles when they got stranded in the office after working on a night shift last Friday, Sept 19, 2014. In addition, Cvx also do contact tracing every 4 hours via automated Notify system so that employees may update the company with current status. Safety is a priority of Chevron not just during storms but in every day work. Talent2 Shared Service Center (SSC) - Communication tree has been activated early morning last Sept 19. This communication has been sent out to our key stakeholders and leaders within Talent2. "Tropical Storm Fung-Wong (local name: Mario) has intensified and has brought torrential rain overnight with the Southwest monsoon. Classes at all levels have been suspended today as many of the city streets are flooded and are impassable to vehicles. Given the situation, we have declared BCP mode for the SSC. Transport arrangements are being arranged for the mission critical resources that need to report to the office. The rest have been advised to stay home and safe and report back on their safety, and carry out the BCP steps as required by the respective domain processes." Expert Global Solutions (EGS) - Unlike before EGS has now implemented BCP check out the sms blast that was sent to us by Emerson Sidayen. Transcom - sent us an email on how BCP is enforced. They have an excel sheet to account the number of employees, status of UPS and transportation. See email below. 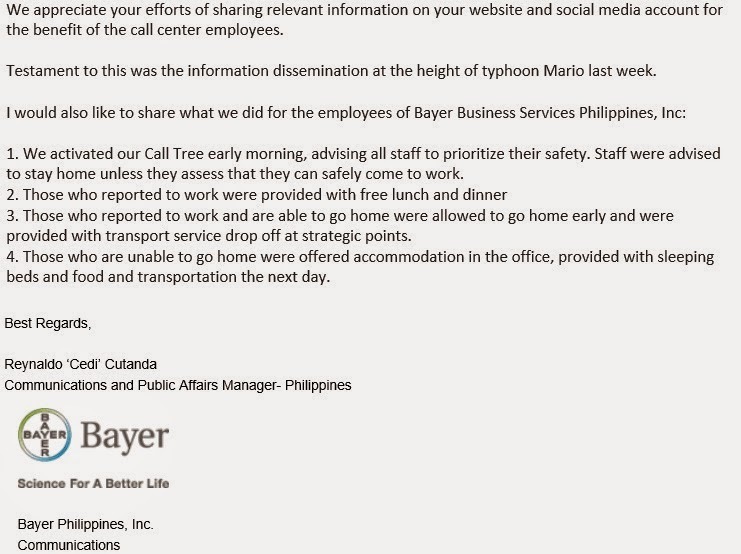 Bayer Business Services Philippines Inc - Call Tree has been activated to prioritize the safety of the staff see the full details below sent by Sir Reynaldo of Bayer Philippines. These are the current BPO / In-House companies that we know of so far that can ensure safety of its employees. The list does not come in any particular order. If your center has the same process implemented please send us an email at thecallcenterfocus@gmail.com so that we can update the list please include if you want your name revealed or not alternatively, you can leave a comment. The inputs are very important since it could help other employees as well. Together let us build a community created by Call Center Employees for Call Center Employees. We have what we call ENACT. It calls/sms/emails us and does not stop til it gets a response from us. 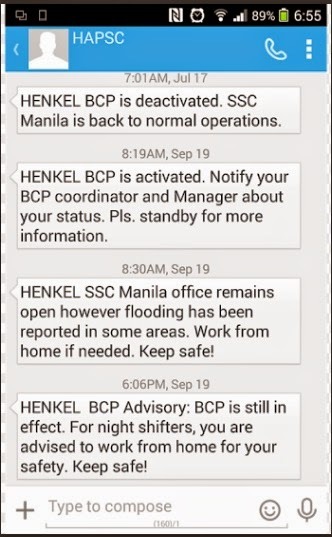 BACP shift was suspended last night. Thank you BACP! Shell shared services.But not sure if we are considered call center. By the way can you provide additional info. How does your company implement BCP. p3ople4u provide double pay for employee who came in to work, if there is a typhoon and also transportation service and free meal. 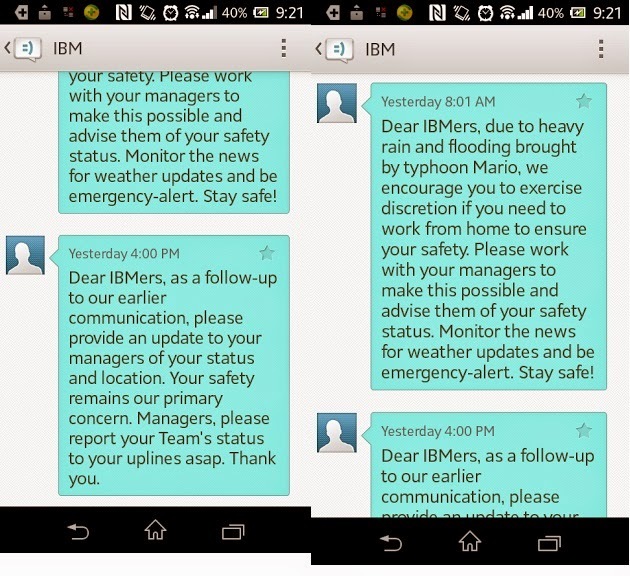 QBE Insurance Group (BGC) - They send out sms to inform employees. They also shoulder transportation costs to and from the office as well as provide sleeping quarters in extreme cases. So true! We even begged for foodstubs for just 1 meal. CONVERGYS - once BCP is activated, Workforce, managers or TLs will contact all agents to make sure they are safe. If it's too dangerous to go home, agents will be encouraged to stay in the office. Lounge, shower rooms, and free food will be provided. How come it didnt happened last time? 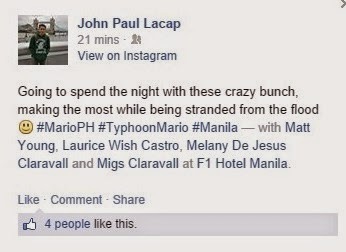 (During this recent Mario typhoon). The only advice we received was the dress down thing which did not directly came from the management, but from a colleague. 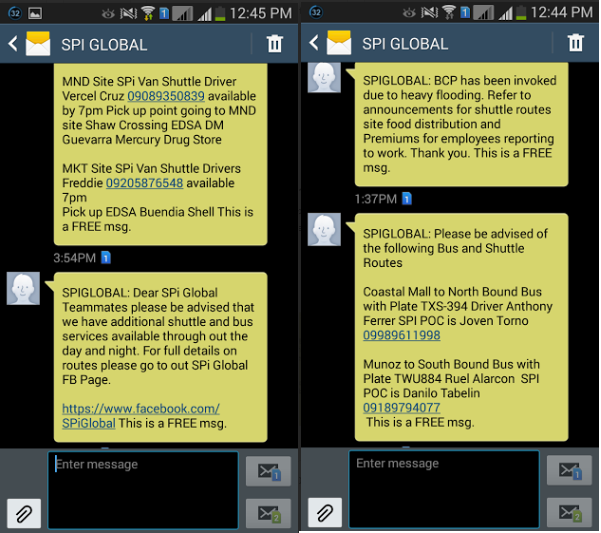 TELUS Internatonal Philippines deploys Noah's Arc, it's a shuttle service made available at different locations. 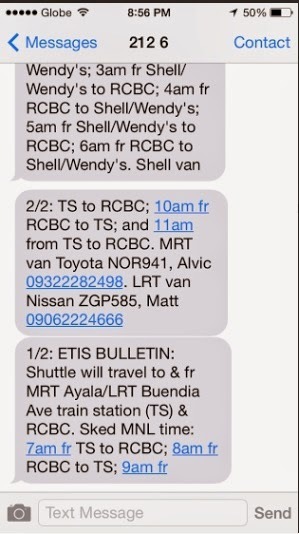 We also have text blast to inform team members situations around the metro. In checking our direct report's statuses, we call them. We also have snooze box where team members can sleep comfortably within the premises (always available not just during calamities). There were also food distributed to those who were stranded in the office. And last Ondoy, those who were greatly affected was given free accommodation at Discovery Suites in Ortigas, including team member's entire family. Concentrix - provides shuttle, free food, site lock down to prevent employees from danger during typhoon and even reimbursts taxi fare for those who come to work. Accomodation at discovery and oakwood hotels. VXI also gives weather updats, free shuttle and free food. We have beddings prepared in the office for those who cannot leave the premises. 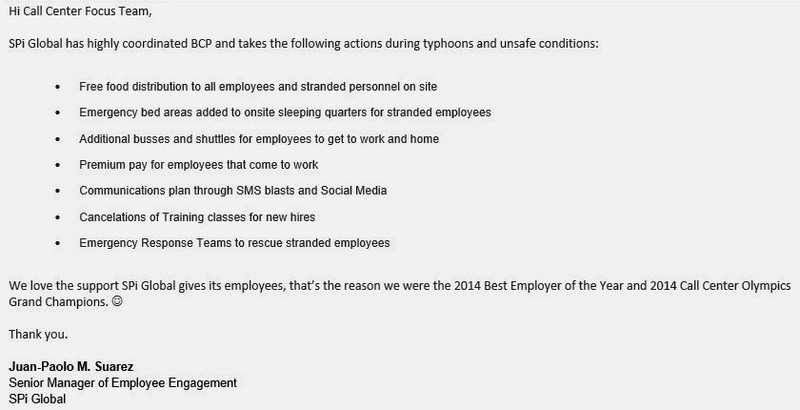 Well, with my 5 years with my company, I only know them doing BCP once, which is during typhoon Ondoy. But if giving free 55 pesos meal (courtesy of our conscessionaire who always fail to serve us good viands) for those employees who defies forces of nature and swim they're way to the office is part of BCP, okay, then they're doing that thing. I so love my company, but not those part of the management who never sees the importance of us agents. Your last paragraph... "this are" talaga? It only shows that we're human. Fyi. @7:46 PM Thanks for the input, that was an honest and useful feedback. @9:13 PM Thank you so much for taking the time to support us. DSM Manila LLC (but we fall under KPO). BCP includes free food and drinks the entire day, unused meeting rooms being converted into resting areas, company vans that take employees home and/or hotel accomodations. 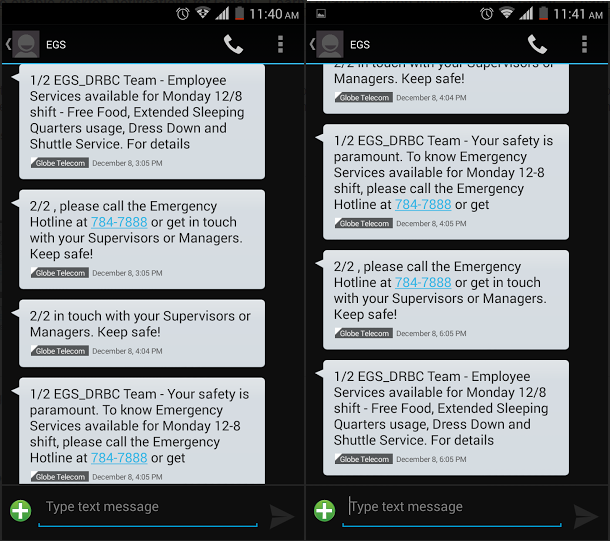 Our emergency messaging system is available, but supervisors/managers normally act ahead of this by proactively asking their team members' status and no one's head gets chopped off for missing work during days when the weather was extreme. ATOS inc. no text at all. goodluck to all atos pips. Takecare of yourself guys as your company doesn't care about you. No FREE food, free shuttle only goes to philcoa, additional sleeping areas and accomodation aren't provided at all. I think it's not the Company's fault. It's the hr management in concentrix UPA who doesn't care about their people at all!! CONCENTRIX SHOULD KNOW THIS!! I strongly believe that Shell Business Operations Manila (formerly known as Shell Shared Services Manila) should top this list. We have a SNS notification system that immediate informs the employees whether BCP has been lifted or invoked. They can contact us through mobile phone, viber, email... 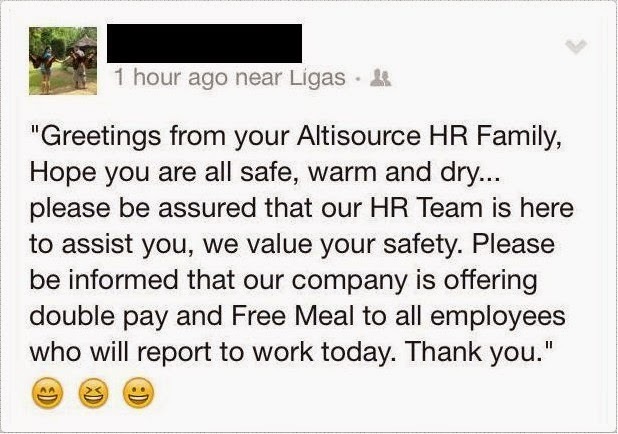 If it happened that employees are stuck at the office, free meals are also given. We also have interim transportation that brings employees right at their respective door steps every 12:15 am, 1:15 am, 3:15 am and 5:15 am. In case of typhoon and the driver thinks your place is in a flooded area, they will not allow you to proceed going home and risk your safety. They would, instead, bring you back to the office where they know you are going to be safe. We also have employee lounges for men and women and shower areas. Most of the teams strictly follow that BCP clothes must remain in our cabinets. Apart from SNS notification or sms, you will also receive a call. If you were not able to respond,you will keep receiving sms and call.this is how SBO ensure that their people are safe. Yeah I can relate to this we love to celebrate those million man hours without lost time injury when I was still working as Junior Admin at PDSI a joint venture of Shell, Petron and Caltex. I dont know how accurate VXI would be, food that has a cut off time, bedding for 10-15 person and if the sleeping quarter is already finished, shuttle bus with time schedule only. HSBC GSC PHIL.has BCP call tree or sms for their employees also..meals/snacks were provided..shower rooms are available. .sleeping quarters are always available for their employees and we also have internet kiosk and some wifi areas...forever HSBC. ..
Stream/Convergys has Love boat who offers free shuttle services in different key locations in the metro. Free food and lounge during those times. Hi Author, Sitel Philippines have our Business Cntinuity Plan. They have provided, shuttle services for stranded employees and food to those who are in our offices. They also have a partnership with metro dorm in home depot should e,ployees would lke to stay. During last years habagat, they also have provided toiletries to stranded employees and company shirts also. You can check their fb page at www.facebook.com/SitelPhilippines as they also provide updates not only to their employees but to all their likers. 5. 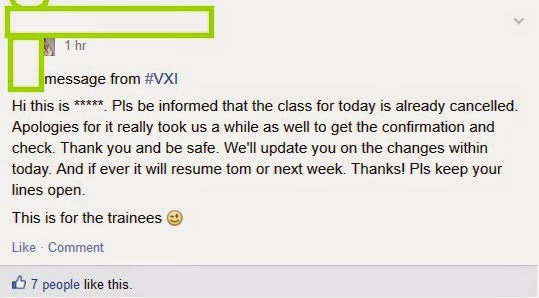 Email / text advisory to prioritize safety. Asan ang ihg, teletech, and, wait for it, teleperformance? Hi. I'm a former employee of JPMorgan Chase and Co. - PGSC, but I would just like to share that they too have a BCP in place. 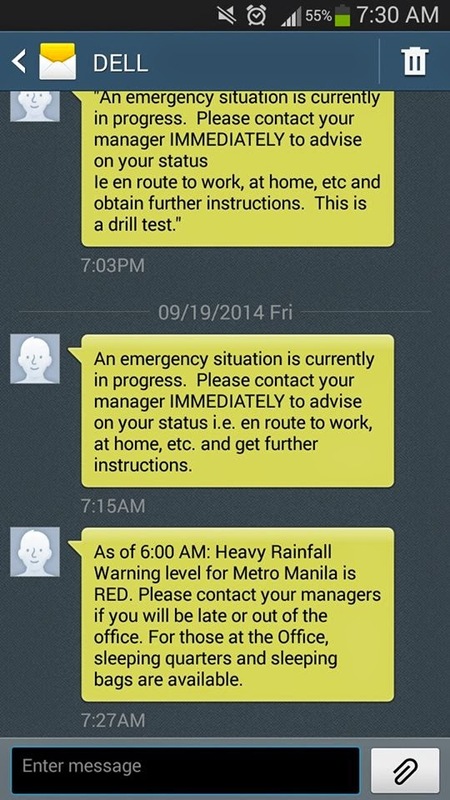 They sent out SMS alerts and a call tree will be activated to alert employees to stay at their homes or to not leave the site if it's dangerous for them to go home. Calls will be routed to other service centers and these centers will inform them of our situation as well. They provide free food, premium pay, and Net Plaza has spacious rooms that are being converted into sleep areas. Sama mo na din si Mang Kulas. Havaianas ba yan? pag oo pwede na hahhahaha. Wells Fargo has BCP too (text and e-mail blasts). They even provided free meals, toiletries, clothing, blankets for those team members who stayed in the office. wala kayo sa 24/7 baha na sa lahat ng dadaanan mo going to work and your supervisor will ask you to take a picture of the flooded area for documentation purpose!!!! potah lang diba!!! wala ka man lang marinig na THANK YOU FOR COMING TO WORK epal!!!! hahahaha....ganun din manager namin, ni kamusta walang kamusta. ni thank you walang thank you. buti naman sobrang okay yung teamlead namin, nagthank you samen at binigyan kami ng GC at HER own expense. It's project dependent. There is an e-mail alert being sent out prior to any calamity for preparedness. Beyond that it depends on the project's management to check on employees. They do provide hotel accommodation and sleeping quarters and food for those who come in to work. Again, that's based on my experience with my current project, hindi ko alam sa ibang project. nabasa ko lang just now to. in my 7 years in Accenture, wala namang free hotel accommodation. though meron nmn sleeping quarters but havent experience din. if u cant come to the office eh mag work from home k pa rin. khit baha na din sa loob ng bahay nio work from home ka pa din. tpos wala man lang pakonswelo mga managers. boooo accenture! Dear SBO Manila Colleague. Please be advised that BCP has been invoked in SBO Manila at 8 30AM Manila Time. Please contact your Line Manager for further instructions. Thank you for all your support and cooperation. Anong Tower mo sir? sa HP din kasi ako and I have been with the company for almost 3 years. palaging may option to work from home. 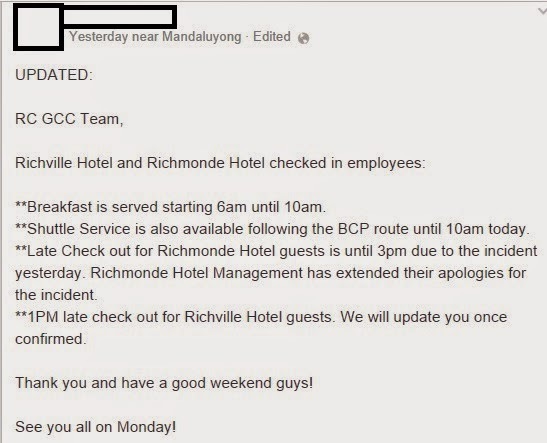 Chevron Holdings has an excellent BCP process...work is suspened early and employees who are stranded get free meals and booked to hotel. We were booked in Raffles when we got stranded in the office after working on a night shift last Friday, Sept 19, 2014. In addition, Cvx also do contact tracing every 4 hours via our automated Notify system so that we may update the company with our current status. Safety is a priority of Chevron not just during storms but in every day work. Example, our computer use and is monitored so that we would not develop RSI and we are encouraged to work in standing for atleast 2 hours a day to.- our tables are adjustable. wow, i am so amazed at all the companies effort to secure their employees! i hope that our company has a very SAFETY core value but when Mario came, our BCP was not activated since our Department Head decided that after assessing the situation, employees can still come in to work. our manager didnt even bothered to text us. sad realization that everything is all words but no actions. Wala TeleTech nyan, niredundant nila mga FM dito na magagaling at napunta na sa ibang call centers, I bet yan mga nglead nyan sa ibang callcenters came from TeleTech like concentrix, aig, vxi...sayang dati all around prep nila, even did rescues sa ondoy. isa ako sa narescue nila at nadalan ng pagkain at boardmates ko. lumipat sila from convergys to Teletech because of that only to find out na wala nala palang ganun dito sa cainta. poor bcp ang teletech, sometimes this is more of what we need to look at fellow agents , how management really cares about us...just my 2 centavos! Tama ka! yan din ang sinabi nang nag post sa Facebook basehan ang listahan na i o kung paano ka importante ang tao nila. meron po teleperf, selected sites. my wife works in convergys maayus din ang bcp nila compared to other BPOs...i guess depends on ur management team. nakakatuwa naman at meron po kayong gantong update. =) keep it up! we need to take a picture of the flooded area for documention... tinanggalan pa kami nang incentive due to attendance... eh anong magagawa namin baha nga di ba? BCP? ano yun? may ganun pala sa iba.. hahaha... no free meal... no free transpo... same rate...and mandatory OT... san ka pa? dito ka nah! I remember a few years back. I'm not sure if it is 2011 or 2012. Im from Cvg by the way. Our house in bulacan is flooded with like 3 feet high from the 1st floor and we were told to get a picture of it as to prove that we need assistance and all that. And even asked to provide the appliances that was damaged by the flood. Our frig and washing machine was damaged that time so i include them to the list as they require it. Afterwards, days passes by, We were given a relief good of like 3 kilos of rice, 1 small soap, clorox, 1 liter of bottled water, and a sachet of detergent (I appreciate the relief goods by the way). I have very high respect to my company, in fact, i've never been proud to be part of it. But the management, a down fall. Hope this will be a wake up call for the management to do better. Please make your employees proud again.